The four trumpet scores reviewed here are all part of the “Edition Immer” series and are published by Musikverlag Martin Schmid. Johann Nepomuk Hummel. Quartet in E Major (for trumpet, violin, violoncello, and pianoforte). Edited by Jaroslav Rouček and Jan Valta. Edition Immer, Musikverlag Spaeth/Schmid, SM 50565. 2012. Also published in a separate version transposed to E-flat major as SM 50566. Johann Leopold Kunerth. Offertorium, Op. 10 (for soprano, keyed trumpet, pianoforte accompaniment and optional choir). Edited by Friedemann Immer and Jaroslav Rouček. Edition Immer, Musikverlag Martin Schmid, SM 50585. 2015. Johann Leopold Kunerth. Quintet (for flute, clarinet, keyed trumpet in D, viola, and guitar). Edited by Friedemann Immer and Jaroslav Rouček. Edition Immer, Musikverlag Martin Schmid, SM 50589. 2016. 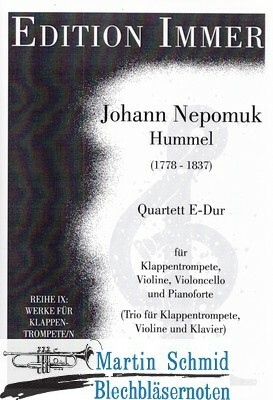 Johann Nepomuk Hummel’s “Quartet in E Major” is a reconstruction of a work performed by keyed trumpet player Anton Weidinger during his 1802–1803 concert tour. In his introductory notes, Jaroslav Rouček argues that the three compositions by Hummel that appeared as part of this tour’s repertoire all probably contained the same musical material—that of Hummel’s trumpet concerto—arranged for different performing ensembles to fit different needs. The original score of this quartet is lost. Therefore, this reconstruction may best be viewed as a reduction of the orchestral score for the smaller ensemble of trumpet, violin, cello, and piano. In this capacity, this edition will serve quite well; most of the details of the orchestral version are preserved in this arrangement. Where exclusions must be made, the editors have made intelligent choices about what to retain and what to leave out of their reduction. The score includes three versions of the trumpet part from which the player may choose. The parts in E and C may be played on either a keyed trumpet or a modern trumpet. A third part that changes among E, C, and D, contains the editors’ suggestions for using crooks to facilitate the use of the keyed trumpet for this piece. The editors’ notes include instructions for converting this music into a trio for trumpet, violin, and cello. I would add that the piano part itself includes most of the details of the orchestral score, so that the piano could accompany the trumpet without the violin or cello if necessary. With all the possibilities the edition offers for chamber performances of this well-known concerto, this score can be of great use to trumpeters who find themselves wanting to perform the Hummel concerto but lacking the performing forces necessary for the full orchestral version. Occasional editorial errors, such as the incorrect placement of pizzicato markings in the violin and piano (sic!) near the beginning of the second movement, may cause confusion during rehearsal, and I recommend that performers consult the orchestral score of Hummel’s concerto to resolve such issues when they arise. An alternate “Quartet in E-Flat” version has been published in the more familiar modern key. It is identical to the E major edition aside from the transposition. Two versions of Johann Leopold Kunerth’s Offertorium are housed in the archives of the castle at Kremsier, where Kunerth worked as a “Stadt-Turner.” The first version is scored for a relatively large ensemble consisting of twelve instrumentalists and at least five vocalists (one or more soloists and SATB choir). Editors Friedemann Immer and Jaroslav Rouček have chosen to publish instead the second version of this piece, with its comparatively small-scale instrumentation: a single soprano soloist, a single trumpet or keyed trumpet in D, piano or organ accompaniment, and optional choir. This edition offers the player a choice among versions of the trumpet part in D, C, and B-flat. The editors suggest that any manner of performance—with or without a choir, using either piano or organ, and using any modern or historical trumpet of the player’s choice—can be convincing. Despite the statement in the introductory notes that Kunerth’s music suffered as a result of his lack of formal compositional training, I find this work to be a charming little piece. Featuring a Latin text from Psalm 40, it centers on D major, with brief excursions into the dominant and relative minor. During the first two-thirds of the composition, the soprano soloist sings; during the last third, she is joined by the choir, if one is present. The trumpet obbligato line holds the piece together. At first, it introduces themes that are to be sung by the soprano. Later, it provides continuity by playing an earlier theme over top of previously unheard choral material. Direct interplay between the trumpet and the soprano soloist is minimal: the two parts never overlap by more than a beat. The layering of the trumpet’s familiar lines over new material during the chorus, however, has the potential to be quite thrilling if properly executed. The Quintet, another Kunerth score edited by Friedemann Immer and Jaroslav Rouček, is a lively piece for a rather unusual ensemble of flute, clarinet, keyed trumpet, viola, and guitar. As with the Offertorium, individual parts are preserved at Kremsier Castle. It is unclear, on the basis of the markings on the trumpet part, precisely what instrument Kunerth had in mind. If performing on historical instruments, the keyed trumpet seems a particularly apt choice since Kunerth is sometimes regarded as the inventor of this instrument. The editors’ commentary, however, argues that performances on modern instruments also have a certain charm. The quintet consists of five upbeat movements in contrasting tempi and meters, all in G major except for the last-movement Adagio in D major. The guitar features broken-chord accompanimental lines, while the three wind instruments carry the bulk of the melodic material. Kunerth experiments with different pairings of these instruments, and octave doublings and quick exchanges of short phrases abound. The versatile viola fills in the gaps in the ensemble, sometimes doubling one of the wind instruments at the octave, but more often working with the guitar as part of the accompaniment or acting independently as the bass voice of the ensemble. Included are parts for keyed trumpet in D, trumpet in B-flat, and trumpet in C. Of the scores reviewed here, this one is the easiest from the perspective of the trumpet performer, whom Kunerth furnishes with ample time to recover between periods of playing. The paper used in these publications is durable and should stand up well to normal wear. From time to time in all of the scores reviewed here certain elements of the notation (beams, slurs, accidentals, dynamics, articulations, and “3” figures beneath triplets, etc.) overlap with one another and get in each other’s way. This layout problem happens often enough to create a slight annoyance, though not enough to actually inhibit the legibility of the music for performance.